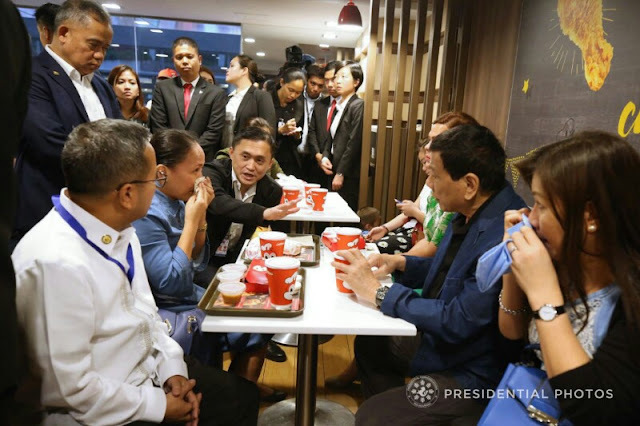 President Rodrigo Duterte dropped by a branch of Jollibee in Hongkong before proceeding to Kai Tak Cruise Terminal where he was scheduled to attend the gathering with the Filipino community. He was with Honeylet Avanceña, daughter Veronica, Davao City Mayor Sara Duterte-Carpio and Special Assistant to the President Christopher Lawrence Go. Duterte also met and bowed to aid and help Alma O. Pardillo, an OFW based in Hong Kong, whose 9-year-old child is suffering from a lung ailment. He promised also a plane ticket, so Alma can go home to attend her another child's graduation.